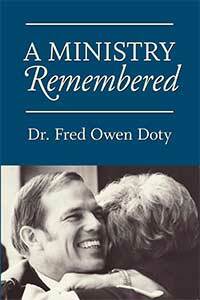 Fred O. Doty brings a sense of compassion to these stories about his ministry, grounded by his childhood in pre-World War II Tennessee and his years as a pastor in churches in Columbus, Ohio, Chalmers, Indiana, Long Beach, California, and Woodland Hills in the San Fernando Valley of southern California. Doty also provides keen insights into the human spirit, informed by his work as a psychologist. During his tenure as minister of the Woodland Hills Church, he completed his Ph.D in psychology. After the Woodland Hills ministry he directed an interdenominational counseling center in Charleston, South Carolina, and retired from his his formal ministry to become a mental health consultant at a Catholic hospital in New Prague, Minnesota. In his stories, you’ll catch glimpses of well-known people like Dr. Martin Luther King, Jr., Eleanor Roosevelt, and Nelson Rockefeller, but you’ll also meet men and women, living everyday lives, trying to find answers to life’s difficult questions with grace, humility, and love.